Lavender essential oil is a popular oil that can help to keep your skin and hair looking healthy. Lavender oil has many uses that include relieving stress, getting rid of headaches, soothing pain, and killing off germs from your skin. You can also use lavender essential oil to treat dandruff or athlete’s foot due to its antifungal properties. One of the reasons why lavender oil is such a popular essential oil is that it is one of the most versatile healing oils. The antimicrobial properties and pleasant scent of lavender oil mean that you can use it with carrier oils to treat many ailments. Lavender oil is also delicate enough to use directly on your skin as a spot treatment. 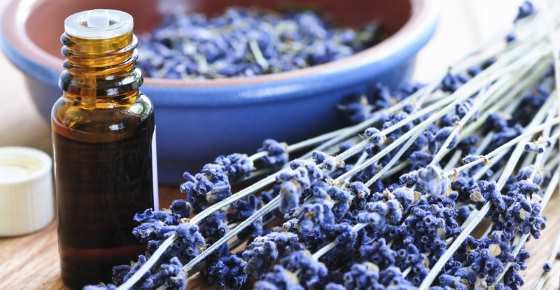 In this article, you will learn about the many uses of lavender oil. You will find out what science says as to why lavender essential oil is good for your skin, hair, and mind. Lavender essential oil is extracted from flowers of the lavender plant (Lavendula angustifolia). People have used lavender extracts for centuries due to its medicinal properties. Lavender oil contains chemicals that are known to have a positive effect on the mind and your general well-being. To use lavender oil on larger areas of skin, you should dilute lavender oil in a carrier oil. Some of the carrier oils you can use for diluting lavender oil are olive oil, sweet almond oil, coconut oil, or jojoba oil. In general, you should use 4-5 drops of lavender essential oil for every tablespoon of carrier oil, or 10-12 drops for each 1 oz (30 ml) of carrier oil. Lavender essential oil benefits your skin and scalp if you dilute it in a carrier oil and apply it topically. You can also use a lavender essential oil in a diffuser to inhale the pleasant aroma if you need to relax or benefit from its calming effect. Let’s look in more detail at the many reasons to use lavender oil to help improve the appearance of your skin, get rid of dandruff, and feel calmer. The antimicrobial properties of lavender essential oil mean that you can use lavender to treat acne outbreaks, pimples, and pustules. One of the best ways of using lavender oil to treat acne is to use a combination of lavender and tea tree oil. Mix 5 drops each of lavender oil and tea tree oil with 1 oz. (30 ml) of sweet almond oil or other carrier oil. Using clean hands, massage a few drops of the lavender remedy on your acne-affected skin to cleanse and moisturize your skin. Repeat in the morning and evening to help get rid of your acne pimples. Learn about more essential oils that act as natural remedies for acne and other skin conditions. Lavender is one of the essential oils that are good for your skin because it is anti-inflammatory and soothing. Lavender and coconut oil or lavender and jojoba oil help to moisturize your skin and keep it hydrated and free of germs. Mix 4 drops of lavender oil with a tablespoon of carrier oil such as coconut oil or jojoba oil. Rub a little of the oil between your palms and apply to your face, neck, or legs to help improve your skin’s appearance. Learn more about why a combination of lavender and coconut oil can help to keep your facial skin looking and feeling wonderful. Another reason why lavender is good for your skin is that essential oil from lavender help speed up the time wounds take to heal. Add 5 drops each of lavender essential oil and tea tree oil to 1 fl.oz. (30 ml) of witch hazel and mix well. Dip a cotton ball in the lavender wound remedy and gently cleanse the wound. Apply the remedy 2 or 3 times a day until the wound has healed completely. Learn more about the proper ways to treat wounds to prevent scarring. You can also find out more uses for witch hazel. Another use for lavender essential oil on your skin is to reduce skin damage and irritation caused by burns. Sunburn or thermal burns can cause blistering, redness, swelling, and pain. However, essential oils such as lavender can help treat burn-damaged skin. Add 5 drops of pure lavender oil to a tablespoon of aloe vera and mix well. Apply the lavender burn ointment liberally to your inflamed skin. Apply 3 times a day to help soothe pain and help the burn heal quicker. Learn more about the do’s and don’ts of treating burns successfully, and find out the answer to how long it takes sunburn to heal. Lavender essential oil can help to deal with various skin irritations, rashes and eczema in a number of ways. For example, its powerful antibacterial and antifungal properties help to reduce skin infections. Lavender is also a natural stress reliever and stress is a known eczema trigger. Lavender oil can be mixed with aloe vera or carrier oil to create a soothing topical application to heal skin irritations. Virgin coconut oil is great for treating eczema, as well as many other carrier oils. Mix 4-5 drops of lavender oil with 1 tbsp. virgin coconut oil or aloe vera. Gently apply the remedy to the skin rash to reduce irritation, itching, and redness. Apply the coconut oil mixture 2-3 times a day to speed up the healing process and get rid of the rash. Further reading: How to Use Essential Oils for Treating Eczema. The fact that lavender is a healing essential oil means that you can use a drop or two of lavender oil to get rid of canker sores in your mouth. Put 1-2 drops of lavender oil directly on the canker sore. Repeat 3 times a day and continue using the lavender oil on the canker sore until it has healed. Find out what else could be the reason why you have sore bumps or blisters in your mouth and what you can do to remedy them. Lavender massage oil can help to soothe inflammation in your joints that are causing pain and discomfort. You can combine lavender essential oil with other well-known essential oils for pain relief. Some of the best oils to relieve pain are peppermint oil, eucalyptus oil, rosemary oil, and thyme essential oil. Add a few drops of your favorite essential oils to a carrier oil such as extra virgin olive oil, coconut oil, or jojoba oil. Massage the pain-relief lavender oil to your sore knee, joints, or lower back every day for pain relief. Alternatively, you can add lavender oil to your bath and help soak away your pain. Add a few drops of lavender oil diluted in a carrier oil to your bath water along with 1 or 2 cups of Epsom salt. Learn more about other essential oils that are good for helping to manage symptoms of chronic pain and inflammation. If you suffer from painful cramps around the time of your period, then try using lavender oil for your menstrual pain relief. Further reading: The Best Natural Ways to Relieve Menstrual Cramps (Research Based). You can use lavender massage oil to massage your abdomen when you experience menstrual pain. Or, you can help induce feelings of calmness and get rid of menstrual cramping by putting lavender oil in your diffuser while you sleep. Lavender oil is good for your feet because it can help to kill off fungal infections and keep your feet smelling nice. There are a number of ways you can use the medicinal properties of lavender oil to cure athlete’s foot. Put a drop of lavender oil in between your toes and then massage the oil into your skin to get rid of the fungal infection. Or, make a lavender oil bath for soaking your feet by using a bowl large enough for your feet. Fill until half-full with warm water, add a few drops of lavender oil and tea tree oil diluted in a carrier oil and 2 tablespoons of Epsom salts. Soak your feet for 10-15 minutes in the lavender water to treat athlete’s foot. You can also put a drop or two of pure lavender oil on your nail if they are thick and crumbly because of a fungal infection. As well as using lavender for nail fungus, find out what else you can do to get rid of fungal nail infections. Lavender oil is good for your hair because it helps to encourage hair growth, stop dandruff, prevent scalp infections, and adds shine and body to your hair. Let’s look at some of the ways you can use lavender to keep your hair looking great. Lavender is good for your hair because it may promote hair growth. You can add pure lavender oil to your shampoo. Try using 10-12 drops of lavender oil for every ounce of shampoo. Use the lavender shampoo as you would use your regular shampoo. Or, add 2 drops of lavender oil and 2 drops of rosemary oil to a tablespoon of olive oil. Massage the oil into your scalp daily and leave for 30 minutes before washing out with your lavender shampoo. Learn about the benefits of using rosemary oil to promote healthy hair growth and help prevent thinning hair. The antifungal properties of lavender oil mean that you can get rid of an itchy scalp that has dry flaky skin. To use tea tree and lavender oil for dandruff control, add 5 drops of each essential oil to one ounce of your favorite shampoo. Wash your hair regularly with the lavender/tea tree oil shampoo and leave on for 5 minutes before rinsing. Use lavender oil with coconut oil as a hair conditioner to add shine and body to your hair. A lavender coconut oil hair mask will also prevent and treat itchy scalp fungal infections. To moisturize your hair with lavender and coconut oil, mix 8 drops of lavender oil with 2 tablespoons of warm coconut oil. Massage the lavender oil concoction thoroughly into your scalp, cover with a shower cap and leave for 30 minutes. Wash your hair as normal. Because lavender oil is useful for reducing inflammation and irritation, you can use lavender essential oil to prevent coughing and other respiratory problems. As already shown in this article, lavender oil has powerful antimicrobial properties, and inhaling lavender steam could help reduce the severity of respiratory infections. Fill a bowl with hot water and add 4 drops of lavender oil and 4 drops of eucalyptus oil. Cover your head with a towel and breathe in deeply for 5-10 minutes. Repeat daily to ease congestion and help clear up a cold quicker. Find out about more natural ingredients you can use to help get rid of congestion quickly and breathe easier. One of the most well-known benefits of using lavender oil is that it has a positive effect on your mental health and emotions. You can benefit from using lavender oil by putting some in your diffuser and inhaling it. Lavender oil also promotes good mental health because its therapeutic compounds help cope with stress and anxiety. To help prevent feelings of worry, trepidation, or apprehension, massage a couple of drops of lavender oil into your temples and breathe deeply. There is also evidence that the positive effect of lavender oil on your mind can also help manage depressive disorders. You could add a few drops of lavender oil diluted in a carrier oil to a warm bath to help relax and lift your mood. Or, you could blend lavender oil with a carrier oil to use as an uplifting massage oil on your temples, forehead, and behind your ears. Or simply diffuse lavender oil in the room. Because lavender oil helps you relax and reduces anxiety, lavender is one of the best essential oils for deep sleep. You can put some drops of lavender essential oil on your pillow if you want to get a better night’s sleep. The volatile oils in lavender essential oil are good for getting rid of headaches and even migraine. Because lavender oil helps reduce anxiety, stress, and improve cognitive ability, it can resolve some of the causes of migraine. Mix 3 drops of lavender oil with 2 drops of peppermint oil in a tablespoon of carrier oil such as extra virgin olive oil. Massage the lavender oil headache ointment into your temples at the first sign of a headache. Learn about other natural ways to get rid of a headache or a migraine naturally. Putting a drop of lavender oil directly on an insect bite can help to reduce itching, redness, and swelling. Please see this article to find out how to use lavender oil for head lice eradication. The antibacterial properties of lavender oil mean that it is a good natural ingredient if you want to make your own deodorant. Find out some of the best recipes to make an underarm deodorant without any harmful chemicals. Generally, lavender oil is well tolerated by most people without significant side effects. One study found that inhaling lavender oil for its anti-stress effects during pregnancy didn’t have any adverse effect. However, because lavender oil is a powerful relaxant, you should speak with your doctor. Can lavender oil be ingested? Many people wonder if ingesting lavender oil is safe. Lavender oil that is not classed as “food grade” should not be used internally. Some manufacturers sell food grade lavender oil, and some studies have been using lavender essential oil internally (43, 44), however this should be done under the supervision of a certified aromatherapist or health care provider. To prevent gastrointestinal irritation, keep internal use of food grade lavender oil to a minimum.